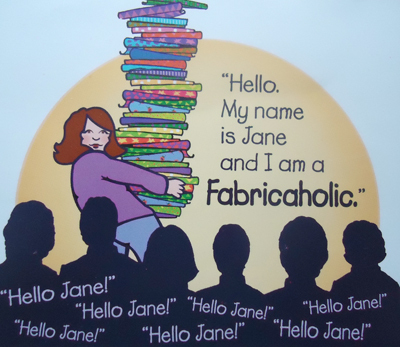 As you know my name is Jane and I am a fabricaholic! 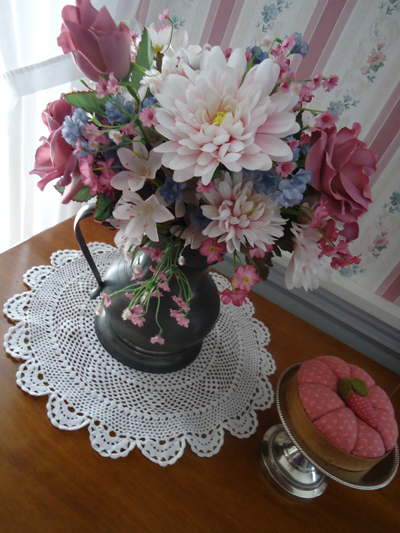 I love all sorts of materials and all that goes with sewing. My collection started small, but has grown from many “good buys” as well as from contributions of friends. Collections can take over a closet, a room, a basement, and even a house. How do I know? Just ask me! Did I mention that I now have two young adult, boomerang children that are back home? Yes, the realities of an extra room or two and more space quickly dissolved and what expanded to fill them now has to be contracted and squeezed to fit back into my spaces that are too little!! I have learned over the years that my great buys aren’t good buys at all if I can’t put my hands on what I need when I need it and have to shop all over again! 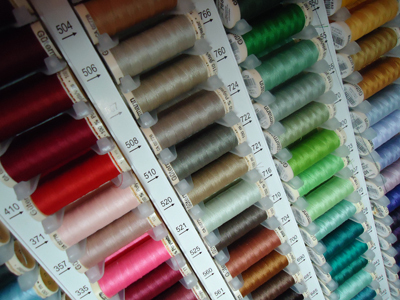 Hence my constant need to organize and re-organize my ever-growing collections of fabric, sewing notions, threads, buttons, patterns, craft magazines, and even machines, two inherited and one fancy embroidery machine, and now a pleater for smocking darling clothes for grandchildren…. whoops, I am ahead of myself again for I don’t even have any grandchildren yet! As sewers know, collections beget collections of containers, shelves, or cupboards. I even covered utility shelves to make my basement studio less visually distracting, hiding as much as I can. A wall of built in cupboards would have been ideal, but this was my less expensive way to achieve much the same effect. 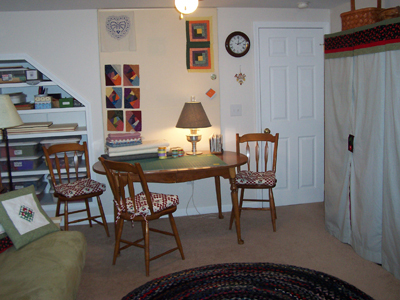 Adding a futon makes it such that my studio doubles as a guest room. Then there are times when what was squeezed and hidden comes out for a show, like the one I am preparing for next Saturday on May 12, 2012,10-6, at 70 Main Street, Greenwich, NY. (call 1-518-692-7041 for more information). 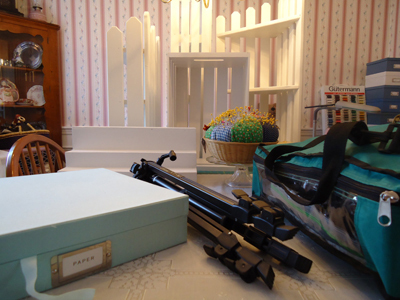 My intentions to get pictures of my favorite sewing space are dashed for now, though perhaps the reality of my recent pictures will make you feel good about your own sewing room or space? 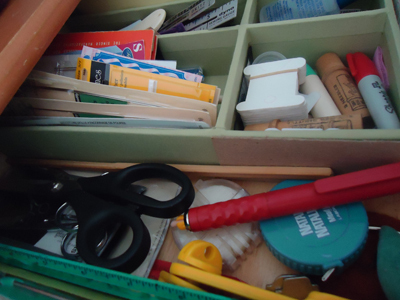 Keeping organized is a forever process with crafts as nothing is more fun than pulling materials out and making a big mess! A professional housekeeper does a “clean sweep” three hours each month forcing me to return all things to their places, or it all gets out of control! I comfort myself with a thought I just read on a sewing website. Essentially it said that years from now, no one will ever know how I kept my house, but my heirloom quilts and creations will be treasured forever!